The programme offers jobseekers an opportunity to gain work experience in Business in the Community Ireland (BITCI) partner companies. As part of that, BITCI invited several candidates to tour Ricoh Ireland’s Production Print Centre in Glasnevin, Dublin, or our HQ in Swords, and decide for themselves if they would like to be a member of our team for the duration of their placement. Typically, candidates in the programme stay for two to four weeks – but that all changed when we met Suzanne Fahy. 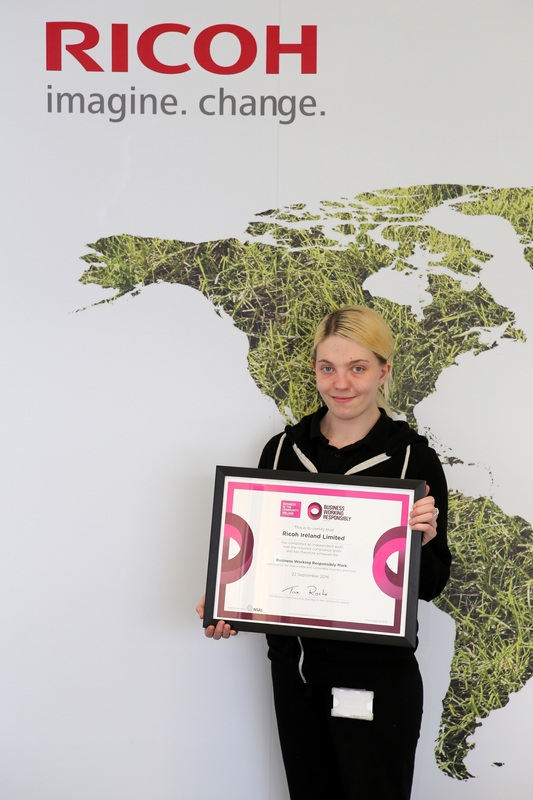 Suzanne came to us as part of the BITCI work placement programme in March 2016 after touring our Production Print Centre, which is where we provide high volume – high quality digital printing, scanning and storage, digital mail, and DVD/USB duplication. After her start in Glasnevin the management team was so impressed by her dedication and diligence that now, she is Ricoh Ireland’s newest production print employee. Suzanne’s story is unlike anyone else’s from the work placement programme because her stint wasn’t temporary. In fact, she was the first-ever candidate in the BITCI programme to be offered a job with a company that started as a work placement. From working on reception, to organising mail, to binding booklets, Suzanne’s speed of learning and work ethic stood out to everyone in Ricoh Ireland. Based on Suzanne’s interest in all parts of our business we sent her for training in one of our managed sites so she would have experience dealing with copying and scanning documents. This allows Suzanne to take on jobs that we receive from the managed sites and also allow us to put her be assigned there during busy periods or holidays. When her four-week placement was up, instead of receiving a note of a job well done, Suzanne was asked to come back for a part-time position at our Glasnevin production site. Thankfully, Suzanne accepted and her tenacity for success with the company has continued. Suzanne has an unyielding curiosity for the business and she has already requested to be trained in different areas of our production print site to further her knowledge. The BITCI placement has not only benefited Suzanne, but it has also benefited us. She has seamlessly integrated herself into the team and with her ability to move between the many functions of the business, she has proven herself to be an invaluable team member. We are proud members of Business in the Community Ireland and have enjoyed being part of the work placement programme. Suzanne’s decision to join Ricoh and begin her career with us has only solidified our partnership with BITCI into the future. Find out more about how to get involved in one of our Business Action on Employement programmes.